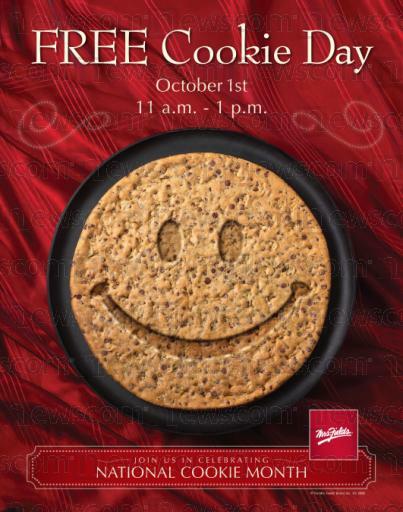 Free Cookies at Mrs. Feilds on October 1st. http://news.prnewswire.com/DisplayRelease -On October 1st from 11 a.m. to 1 p.m. and every customer will get a free chocolate chip cookie. For more in-store freebies and great deals you can check out the coupon/deals section. Sample and save on new Neutrogena® Moisture Wrap Body Lotion at Walgreens! Looking to get hands-on with the latest in daily moisture from Neutrogena? 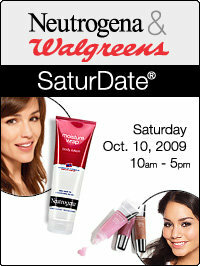 Join Neutrogena and Walgreens for a SaturDate® with Beauty on Saturday, October 10 between 10 a.m. and 5 p.m. at a Walgreens store near you. Walgreens trained Beauty Advisors will be on site to introduce you to the new Neutrogena® Moisture Wrap Body Lotion and Neutrogena® MoistureShine® Lip Soothers. 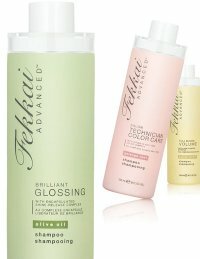 Today September 17, 2009 if you take a full or empty bottle of shampoo to Saks Fifth Avenue and exchange it for one full sized complimentary bottle of Fekkai Advanced shampoo of your choice ($23 value)!! https://myrewardzone.bestbuy.com/ -This is for Rewards member, but it’s quick and easy to join! Best Buy has a coupon for either $10 or $20 off certain video games. XBlades (game for Xbox) is $20, so it is free after $20 coupon – print coupon below!! Offer valid 9/7/09 — 10/4/09. In store only. There is also a $5.00 Rebate Click here on Blades -so a free video game plus $5.00 for free is a awesome deal!! Free Thomas trading card holder at Toys R Us Saturday Sept. 12, 2009 at 11am – 1pm. You will find it on page 6 of the ad. Target has a coupon for Market Pantry Cheese $1 off 2. Free plus possible overage after coupon!